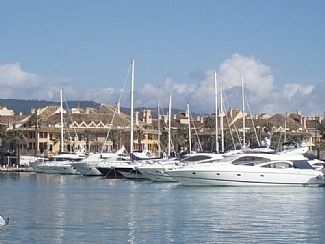 Two bedroom apartment overlooking the marina in one of the best locations in Sotogrande. This superbly located property has terraces at both the front and the rear of the property so the sun can be enjoyed all day long. The front terrace is overlooking the marina. The beach and tennis club are a couple of hundred yards away. El Octogona Beach Club is also nearby. Octogono is the best placed of the two beach clubs for water sports. There is catamaran sailing from the sailing school, jet skiing and waterskiing off the beach nearby and kayaking on the River Guadiaro where a natural lagoon has formed at the river mouth providing an ideal place to learn the skills in a safe environment. Within walking distance of the apartment are all the bars and restaurants of Sotogrande Port. The apartment is perfectly located for a relaxing and enjoyable holiday with all facilities on your doorstep. The key collection point is now in Sotogrande for our guests convenience. I love holidaying here. It is quiet but with all the things you need like the beach, tennis and restaurants within a short walk. The property is located in the quieter end of Sotogrande but still close enough to walk to the port where you will find the wonderful new shopping mall and some great restaurants. The beach is so close you can almost roll out of bed and onto the beach! Around the beach you have the tennis club and sailing school. Also the beach club has a very good restaurant too! En-suite bathroom with bedroom 1 and 2. A gym is located in the port which is a 5 minute drive. Bright living room overlooking marina with sofa, dining table, coffee table and LCD TV. Cooker, hob, fridge, freezer, dishwasher, washing machine and all kitchen equipment. Kayaking and canoeing are available on the beach. Skiing is two and half hours away. There are 5 excellent golf courses including the famous Valderrama golf course within a 10 minute drive. Notes on accommodation: The rental costs and availability calendar are always kept up to date. Please check in after 4pm and check out before 10am Long term rental is available at £1000 per month Outside: The apartment benefits from not one but two terraces at the front and rear for the property so you can stay in or out of the sun all day long. Cleaning / Towels / Linen / Maid service: Towels/linen are included. Maid service can be provided at extra cost. Other: A concierge service to help you with all your holiday needs can be provided at extra cost. If required a basic food and alcohol package can be put in the apartment for your arrival. This is available at extra cost. Clean apartment with nice lounge and two besuited, nice balcony overlooking the marina. Parking is easy on the road outside. The new marina with the majority of restaurants is over the other side of the water, but we liked the slightly quieter feel of this apartment. Thank you very much for your lovely review. I am so glad you had a happy holiday. Look forward to welcoming you back another time. Thoroughly enjoyed my stay in this lovely apartment. It is clean and tidy and in a great location near the beach. There are lots of good places to eat and drink and the tennis club is in walking distance. Sotogrande is quiet though but that suited me as I just wanted to relax. Will definitely book again. It was prefect for a relaxing holiday. 1) I could not believe that I had to stop at La Cala de Mijas to pick up the key to the flat, getting off the motorway and wasting precious time when the owner could have picked a local agent in Sotogrande. What if I flew into Gibraltar? People at the agency are also rude. 2) There is no wifi in the flat and the modem the agency can offer to you is so hopeless I ended up using my own smartphone as a modem. 3) The walls are completely bare, not a single print, so it does not feel welcoming. 4) The kitchen is poorly equipped - there was not even a chopping board or a pair of scissors. 5) The dishwasher leaked on our first use and it took a full two days for an engineer to turn up, who told us categorically that the machine was beyond repair, and that it must have been in that state for a long time judging by a rusty hole through which the leak was coming. This meant we had to wash everything by hand. 6) The shower in the second bedroom was a joke - it created a mist of spray so feeble you could hardly rinse youself. All that was required was probably a new shower head. 7) The fitted wardrobes in the bedrooms had no shelves at all. Given that the tight bedrooms had hardly any space for good size drawers, we had to live out of open suitcases on the floor of the living room. 8) The boiler cupboard smelt badly, possibly from the mop or something else, and the floor brush was so filthy with fluff and hair stuck to it I hardly wanted to touch it. As you can see there isn't much care that has gone into making the flat comfortable or welcoming. Ultimately it is very disappointing because the whole thing feels so loveless and uncared for. Obviously I want everyone to have a brilliant holiday. We have been fully booked this Summer with most guests booking again but everybody is different and will address the issues you raised. There is another key collection point near Gibraltar. Previous guests have used the wifi and had no problems. The dishwasher was fixed as soon as we became aware of the problem. I did suggest you phone me but you weren't interested in discussing the matter. Thanks for your lovely review. I am so glad you had a good time and got good weather too. We would highly recommend this apartment,for a rental property it was beyond our expectations,so stylish & very well equipped. Sotogrande Marina is very upmarket & impressive. The restaurants at Sotogrande serve excellent food & are very welcoming,we would recommend La Terrasse Brasserie. Many thanks for your lovely review and for your the restaurant recommendation. Will certainly check that out. Look forward to welcoming you back. Sotogrande Marina is very upmarket & impressive.The restaurants at Sotogrande serve excellent food & are welcoming. We would recommend La Terrasse Brasserie. Sotogrande is most famous for Polo. There are a massive 18 polo fields located in Sotogrande. In August the famous faces of polo come to Sotogrande to take part in tournaments and it provides and excellent opportunity to watch this beautiful game played by the best in the world. Sotogrande has a nature reserve which is perfect for walking. Mountain biking trails are also close by. For an enjoyable day out take the boat over to Africa which takes only 30 mins. 150 yards to the beach where the El Octogono beach club is located. On the beach you will also find watersports, beach bars and the catamaran service. 1 hour from Malaga airport, 20 mins from Gibraltar. Gibraltar with it's tax free shopping and dolphin excursions is within 20 minutes or perhaps the nightlife of Puerto Banus is more your thing. Puerto Banus is a 30 minute drive away. A boat trip to Africa will also take only 30 minutes for a different day out. Sotogrande Port has a wide range of bars and restaurants to suit every taste. There are also banks and boutiques. The supermarket is a 5 minute drive away. Booking Notes: To be paid in full at time of booking. The following are the charges for cancellation: 8 weeks notice 20%. 6 weeks notice 40%. 4 weeks notice 60%. 2 weeks notice 80%. Peak times are not refunded but alternative dates offered. A 250 euro deposit for breakages is required and will be returned after inspection. Payment is preferred by bank transfer. Changeover Day: We are flexible on changeover days. Please arrive at the apartment after 4pm and leave before 10am on changeover days. Notes on prices: Prices are for the property per week in UK Pounds.